I was writing quotes with pens that I already have but I get asked about flex nibs all the time, and having bought a few of my favorite vintage flex pens from Go Pens here, I thought I’d highlight some gorgeous pens with flex nibs for those of you who might want to snap one up. If I don’t first. I have copied Gary and Myrna’s red box system to highlight the pen in question on the tray! This Pelikan 100 Piston-Filler is in Green Pearl with a black cap. The nib is fine and flexible – great for fine to medium lines so you could use it for daily writing if you would like to. 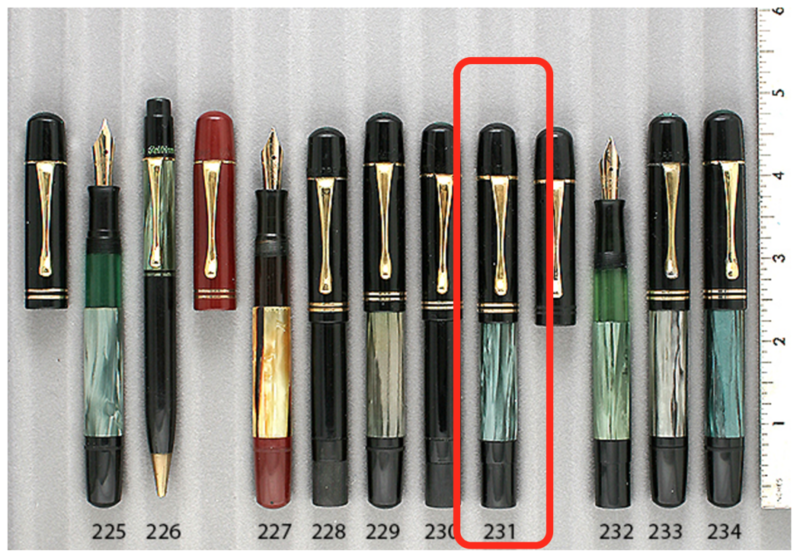 Grab this Pelikan 100 – Item 231 in Catalog #74 – oh, and it’s 10% off! This entry was posted in Vintage Pens and tagged Catalogs, Flex, Flex Nibs, Pelikan. Bookmark the permalink. Follow any comments here with the RSS feed for this post. Post a comment or leave a trackback: Trackback URL.